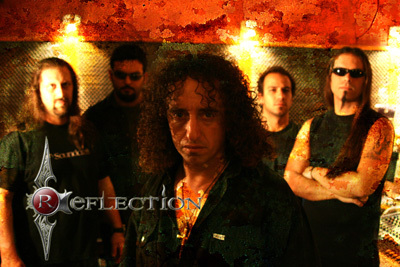 Greek band Reflection was founded in 1991 and gathered recognition by some records and gigs. Recently their third album ‘When Shadows Fall’ was released and it is some kind of new start: a new line-up, a new record company and a new record. This album is a proper true heavy metal CD with doom overtones. Fans of traditional doom metal should check it out, maybe they are even more interested when they know that Forsaken frontman Leo Stivala happens to be the new singer. We were eager to know more about the band and fortunately guitarist Stathis Pavlantis and bass player John Litinakis were so kind to answer our questions. Follow us and discover Reflection! You just played in Athens on November, 16th. Was it a nice experience? Greetings from Greece! The live gig took place on Tuesday 18th of November, sharing the stage with the legendary Tokyo Blade. The place was packed with 350 people and it was the first time that we performed material from “When Shadows Fall” album. We really had a very good time, as we always do when we are on stage and the feedback we received was more than encouraging! Reflection has been around for a long time. Who are the founding members and can you tell a bit more about those early days and your first steps to recognition? 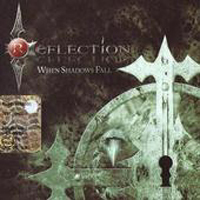 Reflection was formed back in 1991 by a bunch of high school heavy metallers! The core was me Stathis Pavlantis on guitar and my best friend (still is!) Chris Kappas on vocals. John Tolakis was on the bass and Jim Panokostas on the drums. We kept this line up for 7-8 years when Jim due to his medical-long studies could not follow. That's when my brother George came in. Since then we play together. With the first line up we recorded two demos and a 7" inch single (1995) which was our first serious attempt as a band. "The Sire Of The Storm" became 3 times sold out and that's when the real things started to happen. "The Fire Still Burns I" was released in 1998 and after that Jim Panokostas left the band. We are very close friends with Inner Wish and we had this idea for a split single. Jenny Vamvaka from NMC music was very interested on the idea and "Realms Of The Night"
In 2006 came a turning point with line-up changes. What was going on in the band at that time? Actually… nothing. That's the reason we decided to make changes. And I mean all together. I didn't decide on my own. Chris and John had many family obligations and it was difficult to continue doing things for the band. So we were discussing what we should do. The good thing on this one was that all these years we were surrounded by friends/musicians who were very, very close to us and new precisely the situation. So when we had to find replacements it was too easy. The transition was flawless because the new members were like family to me/us and they were always behind the band all these years. So John Litinakis and Iraklis Loukakis came in. Eye-catcher is the recruiting of Forsaken singer Leo Stivala. How did you meet him and how came this cooperation into being? We know Leo through his work with Forsaken and we always liked his voice. As soon as we decided to make the line-up change, he was the first one that came to our minds. We contacted via e-mail and he immediately accepted the offer to become a full member, telling us that he knew Reflection and he liked our music too. Then we had multiple conversations via phone to discuss the details and our future plans and as soon as we booked the gig with Solitude Aeturnus, we had him in Greece for the first time. Any fine (or less fine) memories on that gig? Well this gig was the real first test for the new line up and a dream come true for me (Stathis) since I know personally John Perez of Solitude back from 1992. We performed songs from “The Fire Still Burns” and “Odysseia” albums and the most noticeable, excluding the warm welcome for the new guys, was the chance to share the stage with Solitude Aeturnus (one of our favourite bands ever).The feedback we received was awesome! And of course the fun we had backstage with SA and especially me with John Perez that we met after all these years! It was a magical night! Me and John (Perez), we still discuss about it..
You guessed right. The main composer through all Reflection’s years is Stathis, who is also responsible for the arrangements and the whole production. Of course everybody has put his ideas and his personal touch to the release, including lyrics. The writing process we followed was that, as soon as we had a new idea for a song, or a whole song, the guy who had it (mostly Stathis as I pre-mentioned), was presenting it to the rest of us and then after discussing the details, we had it recorded, to have it, as complete as it could be. Afterwards everyone after taking multiple listens to it, started composing his instrument parts. Finally we had it again recorded with more details, this time, until it takes it’s nearly final form. We use this kind of pre-production. It helps us a lot. Through this we have the basic form and idea of the song and everyone afterwards can make changes/work his parts etc etc. Also the rough tracks are sent to Leo on Malta so he can start having an idea about the song too. He usually records his voice and send it over to us again to see how he feels/thinks that the song should sound. Finding a label is important and sometimes not so easy for a band. How did you get in contact with Cruz Del Sur? Well the contact process was easier this time for us. As soon as we had the first recordings ready, Stathis made a quick rough mix and we contacted some labels sending this promo. One of them was Cruz Del Sur, whose professional job and good feedback, made us choose to negotiate against other labels who showed interest. To be honest that was our first choice so it was difficult not to say "YES"! Enrico is a very professional and good guy. He helped us a lot and he was very patient with us! We have a very good cooperation with him. Can you tell a bit more about your live gigs experience? Reflection is a primary live band and always tempting in doing gigs full of power. We have joined forces on stage with world famous acts like Solitude Aeturnus, Tokyo Blade, Demon, Paul Di Anno, Wotan and many more during our existence, while we have headlined in a lot, too. Are there new plans for gigs or touring in the pipeline? We have some proposals but we are still working on them because it's a little bit difficult because Leo is in another country. But the sure thing is that we'll participate in the "Up the Hammers" festival in March. Drummer George Pavlantis is known from Swan Christy. That’s a long time ago I heard from them though I liked them. Any news on this front? And you'll never hear again cause the band quit playing since then. They had always big arguments between them regarding to music. They never found a common spot from the beginning. Only George is still a musician. The other guys as far as I know they have families and a normal life completely away from music in general. Where did you record ‘When Shadows Fall’? When? And did you use an extern producer? The recording process took place in Stathis professional recording studio (The Music House) during 2007. Even if we had the recordings done in no time, the mixing and mastering process took most of the time. We didn’t of course use an extern producer because Stathis not only is an experienced one, but also he knows Reflection’s sound and how we should sound, better than anyone else. What are the favourite bands of the band members? doesn't know exactly what he listens to (!!! ),and Stathis listens from Candlemass to Ten and Stan Bush!!!!!! The album occludes with an orchestral version of ‘Mistress Of The Sea’. How did you get this idea and what about the execution? I love movie scoring!I'm a very good friend with Kostis Reklitis which happens to work as a producer on my studio too (when he is not in England for composing scores!). He is a heavy metal fan and he likes this kind of epical movie scoring. So we decided (since he liked "Mistress Of The Sea") to make an orchestral version of the song which would be used as an outro. All of us agreed and Enrico from our Label was enthusiast for the idea. Kostis took some audio files with him in England to work and after some months he came back to Greece to do the choir overdubs. And Voila! We really enjoyed it very much! At this time we want to promote "When Shadows Fall" since it's 2 months that was released and we have much work to do about it. But we're having some ideas for new songs too. To be honest we are in a very good and positive mood all these days. We rehearse a lot we hang out together a lot: we eat a lot (!!!). We don't want to press ourselves for something. Everything is going fine for the band and we want to stay like this. We have many really good proposals as I told you that we look at. Well, I wish you good luck with everything, last words are for you guys! I want to thank you Vera from the bottom of my heart for your words and for the interview. I also want to thank our fans and friends that always stand beside us all this time and supporting us. I hope "When Shadows Fall" pays them back!